Having accurate cost, revenue and ROI data in your tracker is crucial. Cost is a somewhat annoying parameter because it is usually available only in detail at your traffic source, often cannot be passed directly in URLs (when bidding CPM, or when you don't want to reveal this data - for good reason), and in general its near impossible to tell your tracker the cost of every click in as much detail as you want. 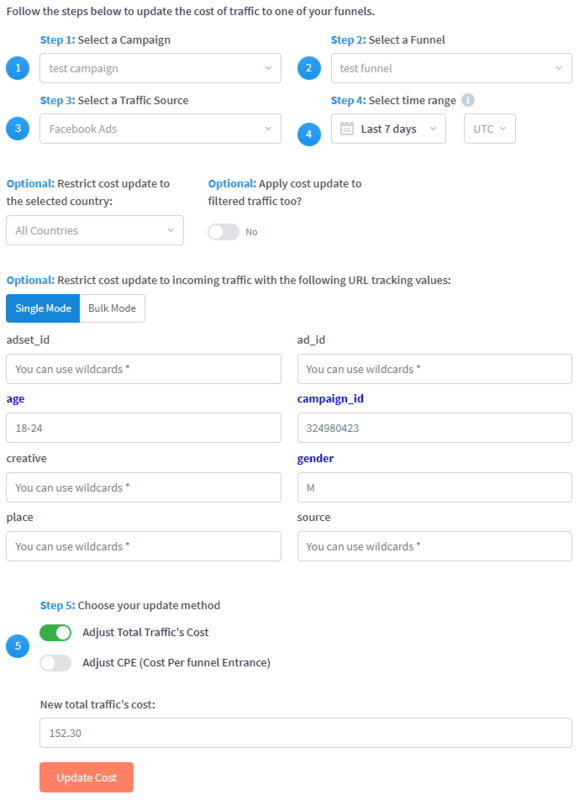 However inconvenient it may be, manually updating costs is a necessary process if you want to have accurate stats - except of course if you have a direct integration with the traffic source, but such integrations are limited no matter the tracker. Let's take a look at a basic single mode upload, then a bulk upload. I have then elected to update the total traffic cost, so the amount I put will be divided across all visitors meeting these conditions. So if I have set 152.30 and it so happens that 873 visitors maeet the above restrictions, it will set a cost per entrance (CPE) of 152.30 / 873 for each of those visitors, thus applying a cost of $0.1745 to each of them. On the other hand if I toggle to adjust CPE, it will set each entrance to have the cost I put. In general it is much more likely that you'll update the total traffic cost for some parameters than adjust the CPE directly, since you usually work with the cost across some aggregate (e.g. creative7 had 467 clicks and spent $13.39 total). Now, this is pretty straightforward, but what if you have a campaign with 50 ad sets, or many site IDs, or 100's of creatives? This is where bulk cost uploads are much more efficient. In bulk mode you can upload a text-based list of cost data. To do this well, its best to use something like Excel, followed by a text editor like SublimeText. 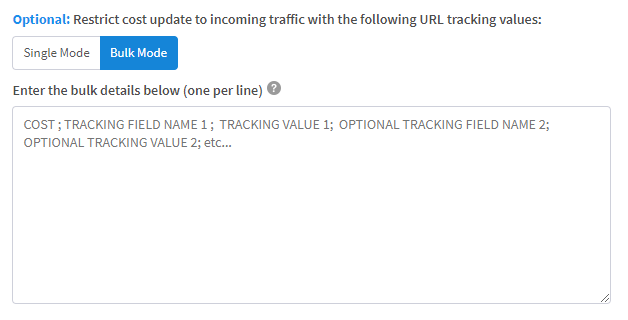 Bulk mode focuses on restricting the cost update based on URL tracking parameters - i.e. the values passed from your traffic source. This is the best way to do it since ultimately your goal is to align cost with the traffic source, right? 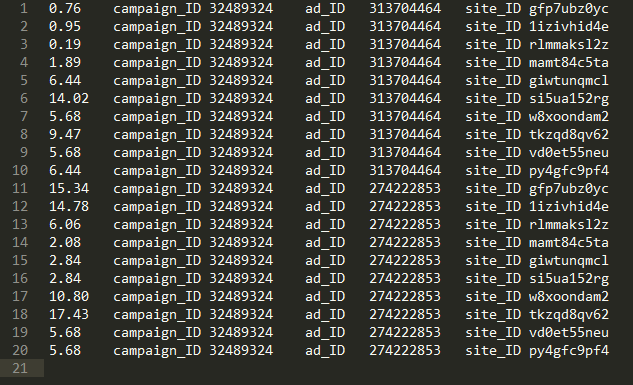 That does mean you need to pass data from the traffic source - ideally describing your ad, campaign, ad set, etc. to make cost segmentation as easy as possible. Here you need to input cost, then a description of what tracking parameters that cost should apply to, and importantly this needs to be separated by ; symbols rather than , symbols, since the latter sometimes appears in tracking field data. With this in mind, you can export detailed data from your traffic source then reformat it in Excel and a text-editor to provide a cost upload statement. 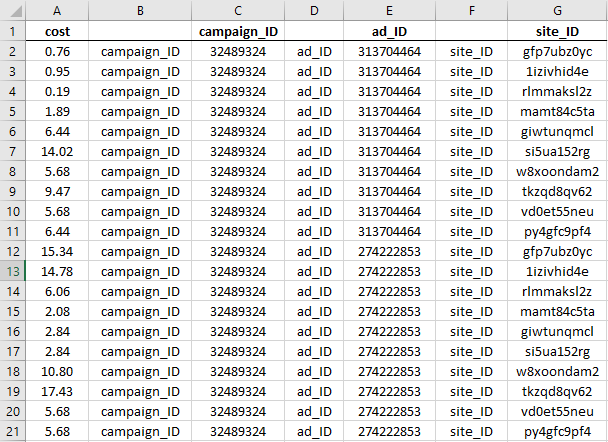 Here I have data for one campaign ID, two separate ad IDs, 10 site IDs for each ad and their corresponding impressions, clicks conversions and cost. You can imagine for a real campaign this could be a spreadsheet with tens of thousands of rows. This is loking good -- each row has cost | tracking-field-name | tracking-field-value. ...and this is exactly what I need! 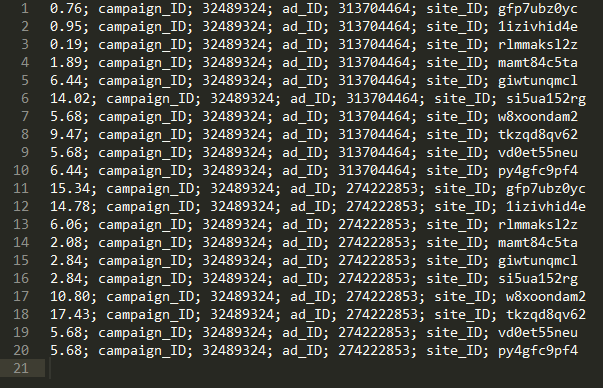 So now if we paste this into the bulk update box of FunnelFlux and hit update, it will run through and find all visitors that match campaign_ID x, ad_ID y and site_ID z, then apply a granular cost update for those entrances. If you want to automate this you can also use the FunnelFlux API and that of other traffic sources to do so.